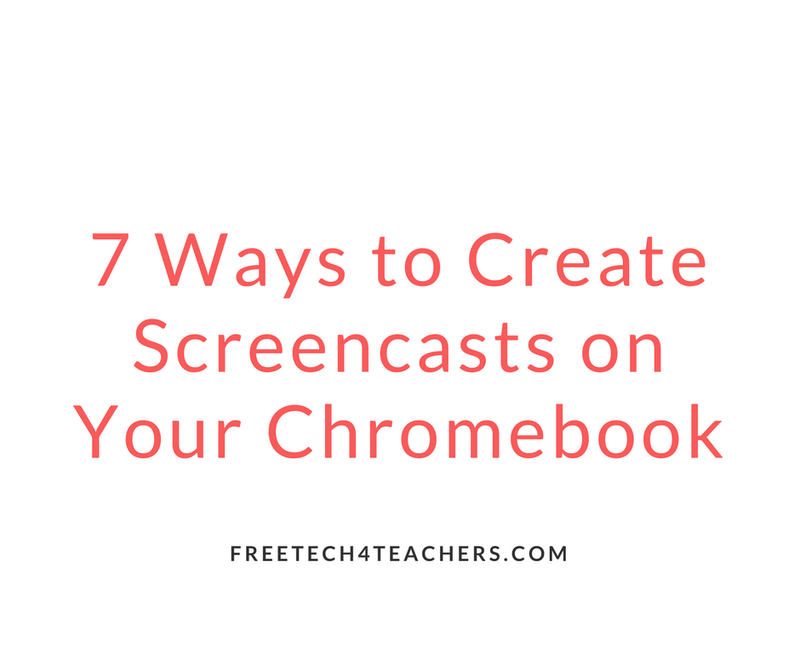 With the addition of Screencast-O-Matic there are now seven tools that teachers and students can use to create screencast videos on their Chromebooks. If you missed yesterday's news, Screencast-O-Matic is currently offering a public beta of their Chrome app. 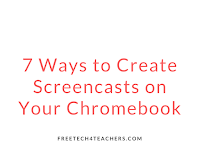 To use Screencast-O-Matic on your Chromebook you will need to go to this page while on your Chromebook, click launch recorder, install the Chrome app when prompted, and then start recording your screen. Screencast-O-Matic on a Chromebook will let you record for up to fifteen minutes per video. You can include your own narration as well as sounds from your Chromebook in your screencasts. Completed videos can be saved to Chromebook or saved directly to Google Drive. When Screencast-O-Matic for Chrome leaves beta, it will probably be my go-to recommendation. Nimbus Screenshot is my favorite tool on this list because of its ease of installation and it is the only tool on this list that provided a customizable countdown timer. I like the countdown timer because it gives me a few seconds to prepare to start talking over my screencast. The other tools just started recording the second that I hit the record button. Nimbus Screenshot was also the easiest to install and configure on my Chromebook. Screencasts recorded with Nimbus Screenshot can be saved to your local drive or to an online Nimbus account. I usually choose to save to my local drive then upload to my YouTube channel. You can also save to your local drive then send it to Google Drive or another online storage service. Screencastify might have the most name recognition in this list, but I don't like it as much as some other tech bloggers like it. The set-up process asks a lot questions that could confuse new users. The free version limits recordings to ten minutes and puts a watermark on the recording. On the upside, there is an option to upload directly to YouTube and to share directly to Google Classroom. The sharing to Google Classroom feature is the one that most fans of Screencastify are quick to point out to me.